Thanks to the rising demand for highly efficient insecticides containing natural ingredients, the U.K. market for insect repellents is expected to witness substantial growth over the next few years. Manufacturers of these repellants are prompted to increase their research activities to develop innovative products, which are highly effective yet cost competent. Insect repellent on skin products are sold through different distribution channels such as supermarkets, online stores, and convenience stores. The increase in the availability of products in convenience stores, supermarkets and online stores are promoting growth of the insect repellent market in the U.K. Manufacturers also sell these products through their websites. Moreover, many companies enter into joint venture agreements with different online stores in order to sell insect repellent on skin products through their websites. The impact of this driver is medium at present, but is expected to become high in the near future. 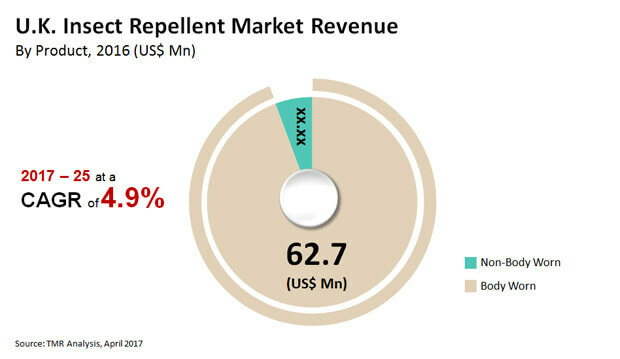 The U.K. market for insect repellents, which stood at US$ 66.4 mn in 2016, is anticipated to increase at a healthy CAGR of 4.90% during the period from 2017 to 2025, expanding the opportunity in this market to US$100.0 mn by the end of 2024. Predominantly, insect repellents are of two types, body worn and non-body worn. The demand for non-body worn insect repellent is much higher than their body worn counterparts. Coils, mats and sheets, electric/liquid vaporizers, and aerosol sprays are the most preferred insecticides among consumers in the U.K. Among these, the demand for aerosol is significantly higher. Aerosol cans are used to kill or repel different insects including mosquitoes, and cockroaches among others. These sprays are not meant for direct application on the skin unlike body worn aerosol sprays. Aerosol cans are tightly sealed and do not leak or spill. Currently, all aerosol containers are tamper-evident and tamper resistant. Moreover, these products are manufactured in such a way that they home in on the target without much effort. Aerosol cans control the pattern of the spray, the size of the particle, the volume released per second, and the concentration of the spray for maximum effect. Hermetic sealed package protects and extends the life of the product. Therefore, the product can be stored for longer time without the risk of getting evaporated. Thus, owing to these factors, aerosol sprays accounted for the major market share in 2016 and is expected to lead the market throughout. On the basis of composition, the U.K. market for insect repellants is segregated into malathion, carbaryl, and pyrethrin (non-body worn) and deet, picaridin, oil of lemon eucalyptus/p-menthane-3, 8-diol, IR 3535, and plant oil (body worn). The demand for malathion-based and pyrethrin-based mosquito repellants is remarkably high in this country. Plant oil-based repellants and oil of lemon eucalyptus/p-menthane-3, 8-diol are also quite popular among consumers. With a number of established participants, the U.K. insect repellent market displays a compartive structure. At the forefront of this market are Avon Products Inc., BASF SE, E. I. Du Pont de Nemours and Co., 3M Corp., and S. C. Johnson & Son, Inc.
Insect repellents prevent and control outbreak of various insect-borne diseases such as lyme disease, malaria, bubonic plague, West Nile fever, and dengue fever, primarily caused by mosquitoes, fleas, ticks, flies, and other insects. The insect repellents market in U.K. is composed of two product types which include body-worn insect repellents and non body-worn insect repellents. Increasing awareness related to insect-borne diseases among consumers is fuelling the growth of the insect repellent market in U.K. According to the WHO, the threat of malaria in U.K. has increased significantly in the last few years. Recent incidents of malaria and West Nile Virus in U.K. have surfaced due to the growing popularity of garden water butts. The warm weather associated with change in the climate has led the residents to install water containers in their homes which coupled with the rising ambient temperature have increased the mosquito population in U.K.
Water butts, especially in the urban areas along with high concentration of garden water containers have attracted a number of mosquitoes to come into a closer contact with people. This factor has become a growing concern for the residents of U.K. as incidents regarding malaria and West Nile Virus has turned up in recent time. Due to this factor, the demand for insect repellent products is witnessing a significant growth in U.K. at present. In addition, increasing distribution channels is another major driver that is driving the U.K. insect repellent market in a positive way. However, stringent government rules and regulations on several ingredients are hindering the overall market growth. . Increase in the availability of products in convenience stores, supermarkets and online stores are promoting the growth of the insect repellent market in U.K. The U.K. insect repellent market is segregated on the basis of product into non- body worn and body worn products. Non- body worn products held the majority market share whereas body worn products are anticipated to witness the most rapid growth rate. Non-body worn and body worn products are further segregated on the basis of products and compositions. Non-body worn products include coil, mat and sheet, electric/liquid vaporizers and aerosol sprays. Aerosol sprays held the majority market share in 2016. The demand for such products is fairly high among the consumers owing to their reasonable cost, high awareness among the consumers owing to their widespread availability across all retail chains such as super markets and hyper markets, convenience stores, and online stores among others. Body worn insect repellent products include stickers and patches, oils and creams, apparels and aerosols. Oils and creams held the majority market share in 2016. This is attributed to the high demand for natural insecticides among the consumers and the safety aspects of these products. Moreover, oils and cream are economical, easy to use, and remain effective for several hours. Non-body worn insect repellent compositions include malathion, carbaryl, pyrethrin and others. Pyrethrin held the majority market share in 2016. This is attributed to its use to control insects such as lice, mosquitoes, beetles, and flies and others. Pyrethrins are found in sprays, dusts, foggers (bug bombs), shampoos and various others. Pyrethrins are also included in head lice products which are approved by the Food and Drug Administration (FDA). Body worn insect repellent compositions include deet, picaridin, IR 3535, oil of lemon eucalyptus/ p-Menthane-3,8-diol, plant oil and others. Oil of lemon eucalyptus/ p-Menthane-3,8-diol held the majority market share in 2016. This product has several benefits such as antibacterial properties, invigorating immune system response, and pain relief and others. The major vendors in the U.K. Insect Repellent Market are Avon Products Inc., BASF SE, E. I. du Pont de Nemours and Company, 3M Corporation and S. C. Johnson & Son, Inc. among others. Some of the key strategies adopted by these companies include mergers and acquisitions, joint ventures and partnerships, product innovations, and geographical expansions.